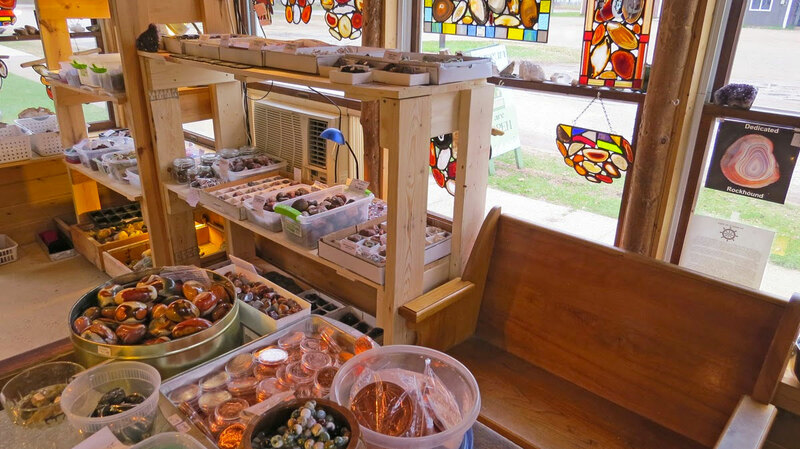 A dedicated group of people have been planning this agate show for a couple of years. The purpose of the event was to celebrate agates and other forms of microcrystaline quartz. Everyone who attended agrees that they were completely successful. There were presenters and dealers from all over the world including Australia, Germany, China, Argentina, Brazil, India, and Mexico. Many of our states were also represented including South Dakota, Michigan, Wisconsin, Colorado, Texas, Montana, Nebraska, California, Virginia, Kentucky, Iowa, Washington, Oregon, New Mexico, Idaho, Tennessee, Missouri, Wyoming, and Minnesota. Below are pictures of the ribbon cutting ceremony to open the exhibits, as well as a picture of the main exhibit area and the agatelady.com booth, which was in the rear corner to the right under the American flag. On Thursday at the show, a lifetime achievement award was granted to the First Lady of American Rockhounding: June Culp Zeitner. She has inspired rockhounds for more than 50 years. Mrs. Zeitner authored ten books and many thousands of articles, columns, and book reviews. Her first book, Midwest Gem Trails, helped to launch the rockhounding industry in the 1950s. In the 1960s she initiated the campaign that later led to all 50 states adopting an official state gemstone. In 1967, June founded the National Rock hound and Lapidary Hall of Fame, located in Murdo, South Dakota to recognize excellence in the earth sciences by inducting one or more persons each year. Below is a picture of June receiving her achievement award. When the booths opened to those who registered for the presentations on Thursday night, the first person who purchased something from my booth was June — which was a real privilege. The presentations in the technical portion of the show on Thursday were outstanding. There were photos and information presented about agates from all over the world. Each presentation was 25 minutes long, allowing questions for five minutes from the registrants. I asked one of the presenters if he thought anyone would ever succeed in manufacturing artificial agates and was relieved when the answer was: “No, not likely due to the complex nature of agate genesis.” Below are a few of the pictures I took of agate close-up slides, that I believe were presented by Doug Moore. In addition to the presentations and dealer booths, there were also agate displays. Below are some pictures of a few of the agates and microcrystaline quartz specimens. The Fairburn Agate is quite large: over 50 pounds! The Pseudomorphic agate is from Chihuahua, Mexico. It formed when agate coated and replaced aragonite. The Tennessee Paint Rock is an interesting mixture of agate, jasper, and chert. The Royal Imperial Jasper is from Zacatacas, Mexico. The Intarsia creations were magnificent and one of the hits of the displays. They were created by Eugene Mueller and are from the collection of Karen and David DeBruin. Each intarsia is a stack of very thin sections of various minerals sandwiched together to create the painting-like images. The 39th annual Moose Lake Agate Days was also a successful show. After trying to get into this show as an exhibitor for many years, my diligence finally paid off. For those of you who have attended Agate Days, you are aware that the rough rock displays are outside and other displays are inside the school. Thunderstorms hit the area on Saturday afternoon, all but shutting down the outside booths. Thus, all of the attendees crowded into the gym. It was nuts. I am sure the fire marshal was no where to be found. For the first time I also attended the informal gathering in the motel parking lot on Friday night. Pictured below is an interesting Lake Superior Copper Agate purchased by Terry Roses. There were more large Lakers than you can even imagine. A few are pictured below.